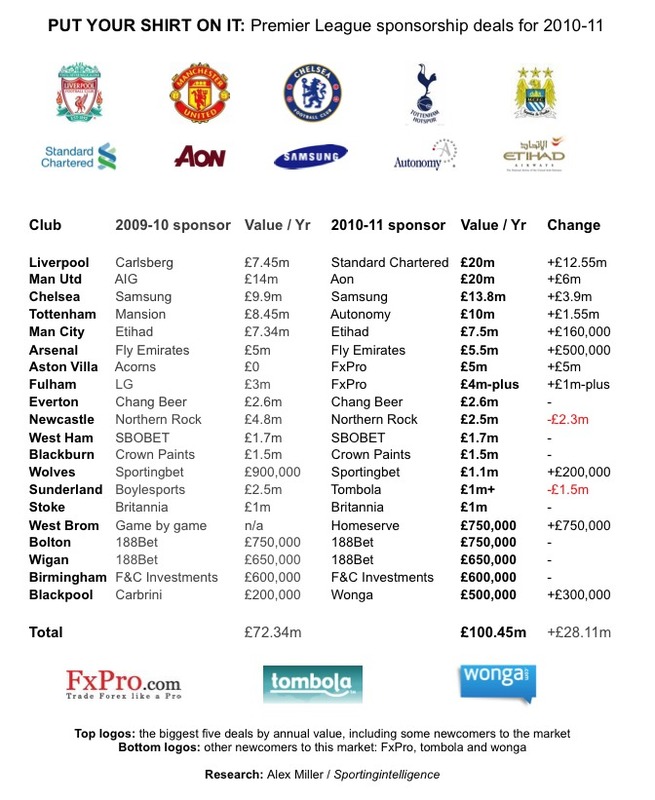 The combined shirt sponsorship income of the Premier League’s 20 clubs for the 2011-12 season has jumped almost 20 per cent from £100.45m to £117.5m, sportingintelligence can reveal. (See table at bottom for full details). The £117.5m does not include any future sums that will accrue to Manchester United because of an imminent deal with DHL for their training kit. The shirt deal values in our table have been ratified by informed sources at each of the 20 clubs, among whom only one club – Blackburn Rovers – will see a year-on-year decline in shirt income, from £1.5m to zero. Of the other 19 clubs, 13 have maintained the same levels as in 2010-11, while six have registered increases, most significantly Manchester City. City’s previous shirt deal with Etihad was worth £7.5m a year. Under their record 10-year sponsorship deal with Etihad, that takes a £12.5m uplift to £20m a year. The renegotiated deal with Etihad (link here) will earn City a little under £350m over the next decade – and covers stadium and campus naming rights and other elements as well as the shirt money. The deal has led to scepticism in some quarters, as discussed elsewhere on this site today, because of concerns it is just a tool to help City bypass Uefa’s new Financial Fair Play regulations. But independent experts among a range of industry insiders consulted by sportingintelligence believe a £20m-a-year deal for City’s shirt is easily defensible. Manchester United (Aon), Liverpool (SC) and City are all now making £20m-a-year from first-team shirt deals, with Chelsea next on £13.8m (Samsung), followed by Tottenham on £10m (Aurasma / Autonomy). Aston Villa have registered the biggest leap aside from City by swapping their £5m-a-year deal with FxPro for a new £8m deal with Genting, a casino company. Villa have leapfrogged Arsenal, whose deal is now only the seventh best in the division. Arsenal’s ongoing deal with Emirates is instructive. At the time it was announced in late 2004, the combined £90m net deal for stadium (15 years) and shirts (eight years) looked massive. Now Arsenal’s current £5.5m annually for their shirts looks paltry compared to their biggest rivals. But back to 2011-12. 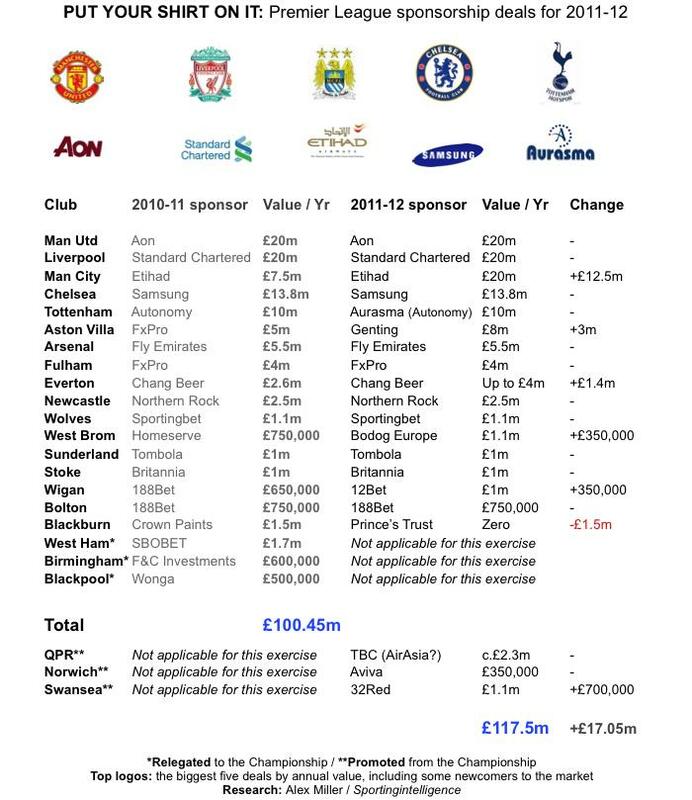 Everton’s renegotiated deal with their existing sponsor, Chang Beer, has had an uplift worth a possible extra £1.4m, to £4m this year, some but not all of which is performance related. West Bromwich Albion, Wigan and Swansea have seen year-on-year rises too. The three newcomers to the division – QPR, Norwich and Swansea – are likely to earn a little more combined for their shirt deals (£3.75m) than the three relegated clubs, West Ham, Birmingham and Blackpool (£2.8m together), but QPR’s situation has yet to be finalised after the change of ownership. QPR’s new majority owner Tony Fernandes has said sponsorship ‘isn’t a top priority’ but the club are looking for a replacement for Gulf Air, who paid £2.3m to be sponsors in the Championship last season. Fernandes says his airline AirAsia will ‘come on board’ if another sponsor isn’t found. The value is not expected to dip and may actually increase. The new Premier League total of £117.5m should keep England’s elite ahead of Germany’s Bundesliga for the moment. In 2009-10, the Bundesliga generated a then-record for a single football division of £98.7m through shirt deals. As we revealed a year ago (story here and table here), the Premier League nipped into the lead for 2010-11. And now it’s kicked further ahead. The League’s relationship with gambling firms continues apace, with seven clubs now advertising gambling firms on their shirts: Villa, Wolves, West Brom, Swansea, Sunderland, Wigan and Bolton. Blackburn took their own gamble – and lost. They had an ongoing relationship with Crown Paints worth £1.5m but unilaterally culled it as the club’s Indian owners hoped to get a larger sum, possibly from a big firm in the sub-Continent. They didn’t, so opted to donate the space to a charity, The Prince’s Trust. Can Manchester City’s ‘new money’ fix their woeful record against Arsenal?